Richard Bushman’s discussion of the Book of Mormon in Joseph Smith and the Beginnings of Mormonism was really good. Surprisingly, his discussion of the Book of Mormon in Rough Stone Rolling was as weak as the one in Joseph Smith and the Beginnings of Mormonism was strong. I’m very curious what he meant. He didn’t like Bushman’s research? Or he didn’t like his conclusions? I put up a question on Dan’s facebook wall but it went unanswered. John, if you’re reading, or if anyone knows what John meant, I think it deserves a clarification. The book looks good. It’s on my “to read” list, but that list seems to grow larger not smaller. I hope I get to it. While I was working yesterday, I listened to this presentation on youtube where the authors of the book give an overview of the book and their research. Additionally, Anthony Sweat talked about the art he created for the book and some interactions he’s had where the church has expressed the desire of portraying more historically accurate art. This painting shown above was his attempt at a faithful and inspiring version of the head in hat translation process. I personally find it very difficult to find the head in hat process inspiring, but I’m trying to keep an open mind. One interesting historical interaction they brought up, which was new to me was that in 1829 when Joseph was trying to get a printer to take on the Book of Mormon publishing project, he actually pulled out the head in hat technique as a sales pitch to try to convince a publisher the Book of Mormon was an inspired work. About 1829, a stout, round, smooth-faced young man, between twenty-five and thirty, with the air and manners of a person without occupation, came into the Rochester Telegraph office and said he wanted a book printed, and added that he had been directed in a vision to a place in the woods near Palmyra, where he resided, and that he had found a ‘golden bible’ from which he was directed to copy the book which he wanted published. He then placed what he called “a tablet” in his hat, from which he read a chapter of the “Book of Mormon,” a chapter which seemed so senseless that I thought the man either crazed or a very shallow impostor, and therefore declined to become a publisher, thus depriving myself of whatever notoriety might have been achieved by having my name imprinted upon the title-page of the first Mormon Bible. I don’t think the Book of Mormon is a translation of writings from ancient American prophets, but I love the Book of Mormon and view it as inspired scripture. I don’t think there’s any one theory that explains all the intricacies of the Book of Mormon and how it came about. Most likely I think it was a product of Joseph’s mind combined with some sort of access to the divine, which is how I would describe scripture in general. I’m fascinated with the coming of the Book of Mormon story, and I appreciate this new piece of information. But like a lot of information related to the restoration of the gospel, it raises more questions than it answers. 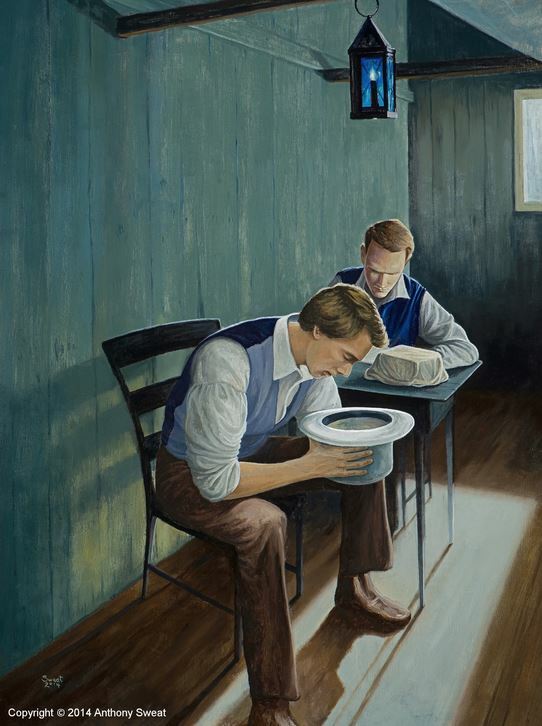 In that moment, when Joseph “read a chapter of the Book of Mormon”, what was he doing? Was he actually viewing text in the seerstone? Was God showing Joseph the text? Why does God seem so distant sometimes, like when the church waited over 100 years to correct the incorrect doctrine that black members should not be allowed the priesthood, yet in this case he was so involved that he was providing a miracle for something so insignificant as an ultimately unfruitful sales pitch? Did Joseph’s mind somehow produce the text but believe it was coming externally? Was the whole thing a parlor trick? If so, did he memorize the text or have small papers hidden in his hat like some have theorized? They also offered a teaser for a future publication. They said “one of the conclusions we come to is that traditional Peter, James, and John narrative is not something Joseph emphasized but in fact it was a product of the succession crisis.” And that they plan to go into further analysis of Joseph’s only statement on this, the chamber of father Whitmer account, which to date Dan Vogel has been the only one to “honestly address this”. Cool. Looking forward to that information. In the end, these things are interesting to me but not vital to how I evaluate the truth of the LDS church. My sacramental approach to Mormonism finds truth in the LDS church not in its historical origins but in the truth and beauty and fruits of the LDS church today. It helps me live a Christ-centered life, worship God, and provides a community for me to serve and be served. My life is enriched. God may or may not have put text in Joseph’s seerstone, but regardless, I know the church is true.